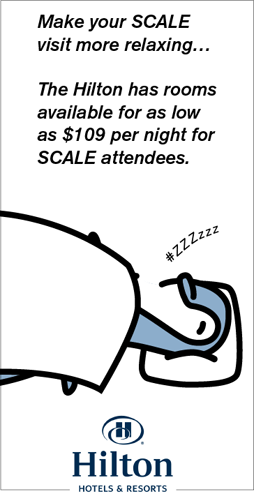 Announcing BoF open registration for the SCaLE 10x. Got a passion you'd like to share? Have a community you'd like to connect with? Want some open discussion on a topic? Create or join a BoF session on either Friday or Saturday night at SCaLE 10x. The Bird of a Feather Sessions (also known as BoFs) will be Friday and Saturday nights, January 20th and 21st. The first start at 19:00 and the last start at 22:00. What is a birds of a feather session? It's an informal meet-up or discussion session, where SCALE attendees can get together and discuss a shared interest without a pre-designated agenda. If your organization is interested in sponsoring snacks or beverages for a particular BoF session, please let SCaLE know by contacting sponsorship@socallinuxexpo.org. Sponsorship is not required to register for a birds of a feather session or meetup. What topics are appropriate for BoFs? Anything you would like! Want a Maker BoF ( Arduino, soldering, knitting, etc )? A board and card games BoF ( Settlers of Catan, Anti-Monopoly , poker )? A foodie BoF? A configuration management BoF? Programming? Cloud computing? Politics? Big data? Community building? Open data and open standards? An excursion to an offsite activity? Its up to you! The Southern California Linux Expo (SCaLE) is celebrating its 10th year as an annual Linux, Open-Source, and Free Software conference held in Los Angeles. The community organized event will be held January 20-22, 2012 at the Hilton Los Angeles Airport hotel. In addition to the evening BoFs, SCaLE offers over 100 seminars and presentation sessions, and an exhibit hall where non-profit and commercial organizations will demonstrate the latest developments in the open-source and free software realm.